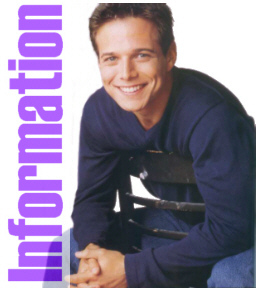 This page is going to be about information having to do with Scott Wolf, like his appearances in talk shows, magazines etc. Or any information related to his career, such as movies, TV etc. This page is intended to keep you apprised of what is happening with Scott's career. There will be no gossip included on this page. If you have any information about Scott that you think should be included on this web page, please e-mail me, and I will put it on my page. You will get full credit for this. Thanks!!! June 13, 1999 - Scott was on the Regis and Kathie Lee show on June 8th. He was asked about how he spent his 31st birthday. He said that he went out to eat with his family and company from the play. He talked about Side Man and said he would be doing it for about 6 or 7 more weeks, but joked he might go AWOL from Party of Five. Scott then appeared on Conan O'Brien on June 10th and spoke about how Side Man won the Tony Award for Best Play and about how he was really having a great time being in the play. May 22, 1999 - Scott Wolf will be appearing on the Rosie O'Donnell show on May 25th, NOT May 26th as reported earlier. Check your local listings. May 15, 1999 - From Ultimate TV, Scott Wolf will appear on The Rosie O'Donnell Show on May 26, reports Playbill Online. May 10, 1999 - Scott Wolf is to appear on Broadway this summer in a play called Side Man. Scott is to begin his stint at the end of this month. He is the narrator in the play which is about jazz musicians. April 26, 1999 - Check out Scott in his latest movie Go, co-starring Jay Mohr, Katie Holmes, and Sarah Polley. I realize this isn't really new information, but I figured I needed to put something here. I actually saw Go about two nights ago and I enjoyed the film.